Schubert's life is the quintessential example of the Romantic notion of the neglected genius who dies in obscurity. Even Mozart, who probably had a harsher life and greater obstacles to overcome, was at least accorded a modicum of recognition in his own lifetime. For Schubert, an entire generation had to pass before his most substantial achievements saw the light of day. 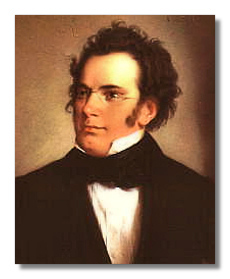 Franz Peter Schubert (January 31, 1797 - November 19, 1828) is one of the few "Viennese" composers who was truly Viennese born and bred. One of five children out of nine who survived infancy he came from a modest schoolmaster's family living in Vienna's Lichtenthal district His father, Franz Theodor, was a keen amateur musician and quickly detected his son's talent, giving him violin lessons while the oldest brother taught him piano. After a short interlude with a private teacher, Franz was accepted as a choirboy in the Court chapel which automatically admitted him as a pupil to the Imperial and Royal City College. There he benefited greatly from contact with men such as Antonio Salieri and Phillip Korner, and wrote his first compositions. Schubert achieved satisfactory results in all subjects, but his musical abilities were recognized by all as exceptional. In 1812 his mother died: his father remarried the following year. Always close to his father, Franz grew to love his stepmother Anna, who in later years helped him with loans of money. While at the College Schubert experienced his first opera performances, and also discovered the music of Ludwig van Beethoven and Wolfgang Mozart. He held the latter in the greatest awe: "O Mozart, immortal Mozart!" he wrote in 1816, "what numberless consoling images of a better, brighter world have you engraved upon our souls!". When he left the College in 1814, Schubert taught at his father's school, though this had little effect on his enthusiasm for composition. Indeed, that autumn his Mass #7 in F Major was performed to great acclaim, also his first lieder masterpiece, "Gretchen am Spinnrade" (to words from Goethe's Faust); he was just 17. The following year was even more impressive: symphonies, operas (no less than four attempted in one year), chamber music and nearly 150 songs spilled from his pen, all written out of a determination to earn money from his music so that he could escape the need for earning it through his detested teaching. Of the songs, the Goethe setting, "Der Erlkönig", is the most remarkable and most famous. A friend sent this and 30 other Goethe settings to the great man himself in Weimar. They were returned unaccompanied by any offer of help; Goethe did not appreciate Schubert's attempts to heighten the poet's words through his musical commentary. "Der Erlkönig" was published in all the German-speaking territories and made Schubert famous outside his native city, and this led directly to a meeting with a young law student, Franz von Schober. Schober had come across "Erlkönig" and the song made such a deep impression on him that he determined to meet its creator. He suggested to Schubert that they take lodgings together at Schober's expense. With his father's consent, the 19-year-old Franz moved in to rooms in Schober's mother's house. While there he was introduced to the baritone Johann Michael Vogl, a successful operatic singer, who was so excited by Schubert's songs that within a few weeks the pair were performing concerts for Viennese society. In 1817 Schubert branched out into piano sonatas and before the end of the year he had also written three more of his most famous songs: "Der Tod und das Mädchen", "An die Musik" and "Die Forelle". By then, however, he had been obliged to move back to his family home – the Schober idyll was over and his work rate slackened noticeably when he returned to the hated teaching. The following summer he became music master to the children of Count Johann Esterházy in Zseliz (in Slovakia, hundreds of miles from Vienna), and broke forever his ties with teaching. After a fitful summer at the Zseliz residence, Schubert returned to Vienna with the Esterházy family but took up lodgings with his poet friend Mayrhofer. He continued to teach the Esterházy children while "living out". Schubert's life remained uneventful until the summer of 1819 when he joined Vogl on a trip to the country, spending three of the happiest months of his life discovering countryside which he thought "inconceivably lovely". This trip had a beneficial effect on his creative juices, the wonderful Trout Quintet being conceived and begun at this time. Inspiration remained with Schubert all through the following autumn and winter in Vienna, compositions coming thick and fast. During his time with Mayrhofer, Schubert would often sleep in his clothes, or leave his glasses on overnight, indulging in typical bachelor behavior and using the time-worn excuse that "it saved time and trouble" when asked why he was so slovenly. He certainly was not lazy when it came to composing, commenting: "I compose every morning, and when one piece is done I begin another". The spring of 1819 had been spent writing the music for a third-rate one-act libretto, Die Zwillingsbruder, which was staged in 1820 with Vogl taking both twin-brother roles. This relative failure (only five performances) led to a further commission for music for a three-act play, Die Zauberharfe. This was no better than the one-act play that preceded it, but Schubert's music shone out: the overture, for example, was later reused in Rosamunde, and thus gained immortality. Schubert's reputation in Vienna was hardly well-served by such failures, and he was never to see another presentation of his theatrical music. Schubert moved from Mayrhofer's rooms to the house of a new friend, the amateur painter Moritz von Schwind, and was soon at work on one of his most striking Goethe compositions, a setting for four tenors and four basses, with string accompaniment, "Gesang der Geister über den Wassern" (1714), the work's mystical element holding great significance for him. Schubert's songs were now receiving fairly regular performances by his friends and colleagues in Vienna, and it is singular that he consistently failed to have them accepted for publication by local publishers. Frustrated by this intransigence, his supporters funded a sponsored publication of "Erlkönig" by the Viennese firm Caspi et Diabelli. This and seven other sponsored publications did so well that Caspi et Diabelli afterwards published Schubert direct and at their own risk. Schubert also managed to raise some much needed income by dedicating these pieces to wealthy patrons. The ambition to compose weightier material continued to haunt him, and in August 1821 he attempted his Symphony #7 in E Major (D. 729), but this was only completed in full score up to the 110th bar; the rest was left marked down on a single line, accompanied by detailed annotation as to how the missing parts would be completed later which, of course, never happened. In recent years this and the other unfinished symphonies (Schubert only completed one of his many symphonic projects) have been given orchestral "realizations" which enable the music-lover to hear brilliant and exploratory works otherwise condemned to perpetual obscurity. Schubert had returned to live at Schober's house, but was now immersed in a triangular friendship of great intimacy with Moritz von Schwind and a young playwright, Eduard Bauernfeld. The composer meanwhile persisted with his attempts to mount a successful opera, and in 1822 completed Alfonso und Estrela (D. 732). It was never produced, the libretto (by Schober) falling foul of Vogl's censure and therefore not receiving his influential backing. Three other events made this a pivotal year in Schubert's life. In April he met Beethoven, a meeting achieved by the presentation of his Variations on a French Air, Op. 10 (with a fulsome dedication) to Beethoven by a mutual friend. Accounts of the meeting are unreliable, but there is reason to believe that Beethoven enjoyed the Variations enough to keep the music in his possession. The second event was the writing – and abandonment – of the famous Eighth Symphony (Unfinished), although by now Schubert had a number of unfinished symphonies to his name. The multiplicity of reasons advanced for the abandonment of this sublime two-movement torso tend to prove that no-one really knows why Schubert stopped writing it. What is beyond dispute is that he presented the manuscript the following year to his friend Anselm Huttenbrenner. The work disappeared until 1865, when Huttenbrenner allowed it to be performed in one of the Vienna Gesellschaft der Musikfreunde concerts and published the following year. This work was a clear statement from Schubert that he had found his own original approach to symphonic form. The third event of 1822 was a tragic one: Schubert discovered that he had contracted syphilis. This discovery, and the illness which accompanied its initial onset, forced Schubert to return to the parental home. Until late spring 1823 he was too ill to leave the house, and this frightening collapse in one so young (he was just 25) led to a near-suicidal depression. A spell in Vienna General Hospital seems to have helped, and he composed all through this dark period of suffering, completing the Piano Sonata in A minor (D. 784) and another one-act opera, Die Verschworenen. During the summer he left hospital and traveled to Linz and Steyr, beginning yet another doomed opera, Fierrabras (D. 796), set to yet another poor libretto, and composing the first songs of the immortal cycle, Die schöne Mullerin. His health remained precarious throughout the year, only stabilizing as winter took hold and the Mullerin cycle was completed. It is possible that Schubert felt he had overcome his affliction, but the disease had only entered its second phase. From this time on his previously carefree and sunny disposition became more troubled, his moods unpredictable. The year 1823 closed with yet another theatre-music failure, this time the play Rosamunde, written by Helmina von Chezy. It managed just two performances, then vanished into oblivion. The orchestral music Schubert mustered for this play eventually proved to be some of his most popular. In spring 1824 Schubert turned to chamber music: among the masterpieces to emerge was the quartet Der Tod und das Mädchen, which used variations on the song of the same name. The magnificent Octet in F (D. 803) followed soon after. This, plus the publication of the first part of Die schöne Mullerin, made this a special spring. Yet Schubert's mood was dark. He wrote to a friend at this time: "Think of a man whose health can never be restored and who from sheer despair makes matters worse instead of better. Think of a man…to whom love and friendship are a torture… every night I go to sleep hoping never to wake again…". Schubert spent much of 1824 once again with the Esterházys in Zseliz; the slow pace of life seems to have been beneficial, although he chafed at having to teach again. The following year was notable for the steady increase in the number of his songs being published and the resultant spread of his reputation beyond Vienna. A summer holiday with Vogl in the country gave him the happiness and peace of mind which had been so conspicuously absent the previous spring. Here he began work on his Symphony #9 ("The Great") in C Major, the first to be completed in more than six years. His return to Vienna in September initiated a twelve month period of great conviviality in and around Vienna with the famous musical evenings among his friends and admirers – known as the Schubertiads – standing out in the memory of all who attended them. Schubert and Schwind remained particularly close during this time, sharing lodgings, food, clothes and money. To Schubert, Schwind was "seine Geliebte" (his beloved). Early 1827 was memorable for Schubert's commencement of the first songs in Die Winterreise and for the death of Beethoven. Schubert had visited the fading genius shortly before his death, and was one of the torchbearers in his funeral procession. Notices of Schubert's numerous lieder publications at this time continued to multiply and spread across the German-speaking countries, yet his major instrumental achievements were hardly known outside his circle of close friends. He completed Winterreise by the end of 1827, the emotional profundity of the music echoing the bleak depths of the verses being set. His health was again poor, with random headaches and dizziness; his moods were clearly reflected in his songs. The complexities of the Impromptus written at around this time are perhaps a prism through which his melancholia can be glimpsed. In March 1828 a concert was organized in one of the Vienna Gesellschaft's private rooms, which was the first-ever Schubert-only event. It was sold-out and filled with Schubert's friends, patrons and admirers. The program was exclusively made up of lieder and chamber music. Schubert completed his Symphony #9 "The Great" in C Major and for a time hoped it would receive a performance in Vienna, but this came to nothing. In September he moved in with his brother Ferdinand. Now suffering from regular headaches and nausea, he composed his last three Piano Sonatas, D. 958, 959 & 960, as well as the famous song "Der Hirt auf dem Felsen" (with clarinet obbligato). By now he was close to exhaustion, and a short walking tour confined him to bed. The syphilis was now claiming him, and on 19 November he died in his brother's bed. The funeral was a modest affair, his coffin borne by students to St. Margaret's Church, and from then on to Währing cemetery. Ferdinand went to every conceivable effort to see his brother's music published (mostly by Caspi et Diabelli Co), but it was 1835 before a visit by Robert Schumann, by then an influential critic and budding composer, discovered the symphony manuscripts in Ferdinand's house and wrote about Schubert's genius after reading the score of the Ninth Symphony. He then arranged for its world premiere and a complete re-evaluation of Schubert's achievements began that paved the way for his true musical worth to at last reach a wider audience. A complete edition of his works appeared for the first time between 1884 and 1897. Quartets #12, 13 & #14 "Death & the Maiden"